A complete list of over 300+ attractions & events for theLake District & Cumbria in the UK for tourists or day trippers.Searchable by location, text, category and map. - Indoor, Free and disabled attractions Listed. - GPS for locality search. - Network for updating app files & weather. Developed by a local team in the Lake District itself. Great Days Out - Lake District & CumbriaA complete list of over 300+ attractions & events for theLake District & Cumbria in the UK for tourists or day trippers.Searchable by location, text, category and map.App functions==========* REGULAR FREE UPDATES* NEW PUBLIC TRANSPORT LINKS- 300+ attractions & events (regularily updated)- 5 day weather forecast for major tourist destinations- Wifi hotspots- Search by keyword, map, nearest (requires gps), category- Indoor, Free and disabled attractions Listed. 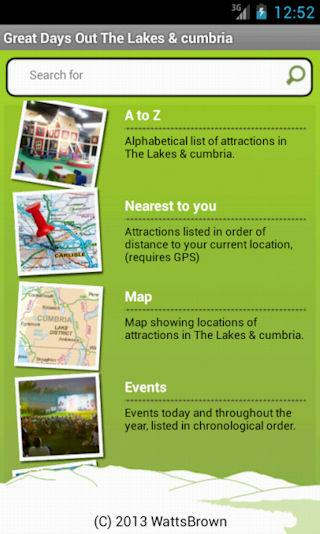 Great Days Out - Lake District & CumbriaA complete list of over 300+ attractions & events for theLake District & Cumbria in the UK for tourists or day trippers.Searchable by location, text, category and map.App functions==========* REGULAR FREE UPDATES* NEW PUBLIC TRANSPORT LINKS- 300+ attractions & events (regularily updated)- 5 day weather forecast for major tourist destinations- Wifi hotspots- Search by keyword, map, nearest (requires gps), category- Indoor, Free and disabled attractions Listed.Requirements============- GPS for locality search.- Network for updating app files & weather.Developed by a local team in the Lake District itself. These guides are intended as an aid for walkers visiting the UKlake district (OS map coordinates are provided on the maps). 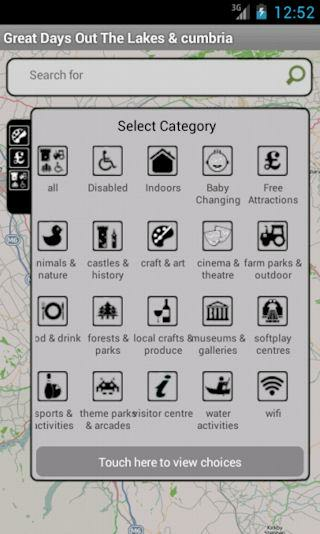 Bestfor large screen Android devices in order to have sufficientresolution for reading the maps and directions.OS Vector Maps (ofGreat Britain) now available on newer devices (API level 10) andtablets. Offers much better resolution (than other maps) plusheight shading and contour overlays.This "free" version hasembedded advertising. A complete offline tourist map of the Lake District. Useful forfinding your way around and discovering what there is to see anddo. Please note that these maps are the latest Ordnance Survey OpenData (which does not include height shading and other features ondetailed maps). However, we have enhanced them with useful touristfeatures, including parking, attractions and popular fells. All themaps are GPS located and will mark your current position (fordevices with GPS). Maps Included: * Regional map of the wholeCumbria area. * Detailed Map of the Northern Lake District (Keswick,Derwent Water, Buttermere, Ullswater). * Detailed Map of theSouthern Lake District (Windermere, Conniston, Wastwater,Ambleside). * A to Z index of popular tourist places andattractions. Tap hotspots of popular places to see moreinformation, including opening times, prices and phone number. Ullswater ‘Steamers’ is an awardwinningenvironmental accredited Lake District Cumbriaattractioncelebrating over 150 years of operating lake cruises onEngland’smost beautiful lake, Ullswater. Ullswater ‘Steamers’create theperfect opportunity to combine a lake cruise with some ofthe mostfamous and spectacular walks in the Lake District.This app accompanies your boat trip by providing audiocommentaryand a map of the lake.